DIY Home Staging Tips: Is Your Mantel Decorated for Fall? 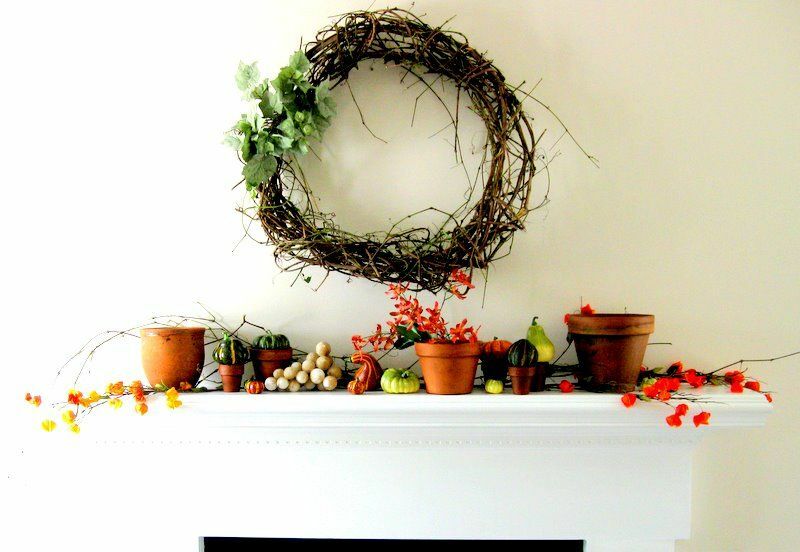 Is Your Mantel Decorated for Fall? When your home is for sale, some seasonal touches help make the place look tended and freshened. The autumn season, no matter where you live, seems to beg for natural props like leaves, vines, dried berries, and gourds. A fireplace is almost always a room's focal point. And the mantel is a wonderful place to showcase that room and the season, whether it's the pale green foliage of spring, the bright (silk) flowers of summer, the earth-toned harvest items of fall, or some glitzy props of Christmastime. I assembled this mantel from autumnal kinds of things, some from the crafts store, some from my props closet, and some from the woodsy lot next door to my home. Fall colors are part of my favorite palette. But autumn doesn't have to be all about oranges, blacks and browns. 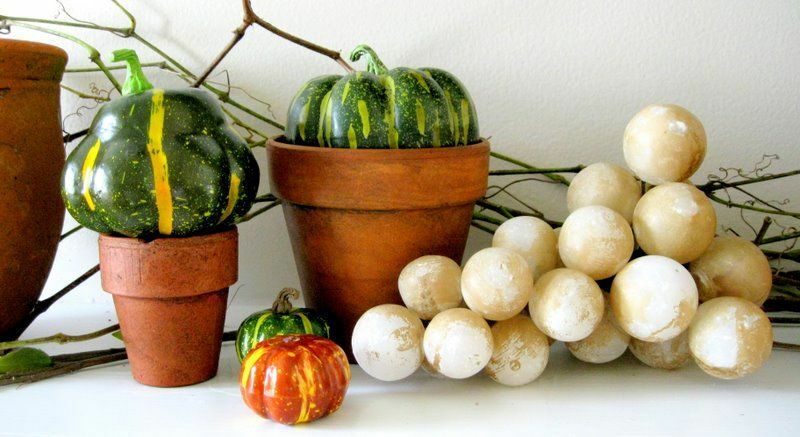 White pumpkins are all the rage now, and gourds come in all kinds of colors. So, if your room, the one that houses your fireplace, is built around clear, cool colors like blueish pinks, pale lavender, icy greys, or blueish greens, you can still build a mantel around white and black, greens and browns, or variations on your color scheme. Someone got paint overspray on these glass grapes. They look frosty, so I left them that way. The mantel I pulled together started with the grapevine wreath I made in about 15 minutes from wild vines I pulled down. It's about the easiest wall decoration in the world to make, and a great base for any seasonal staging prop. Of course, the craft and decor stores are full of them, in all shapes and sizes, but I'm too cheap thrifty to spring for a $20 wreath base. I kept the wreath simple, hung it on the wall over the fireplace, and lined up my selected items on the narrow mantel. Then I adjusted them, until it all looked interesting and balanced. I wrote about five different formulas to stage a mantel in my eBook, DIY Home Staging Tips to Sell Your Home Fast and For Top Dollar. When you're tweaking a mantel staging, look for a variety of shapes and sizes. Make sure some of your items share a purpose, a color, or some other quality. Since this staged home looked too sterile, I liked the look of a wild and crazy wreath. I chose a group of my own terracotta flower pots to ground the mantel ledge. Then I added some orange and green flowers, some leftover vines, and gourds that must have cost all of five bucks at Michaels. 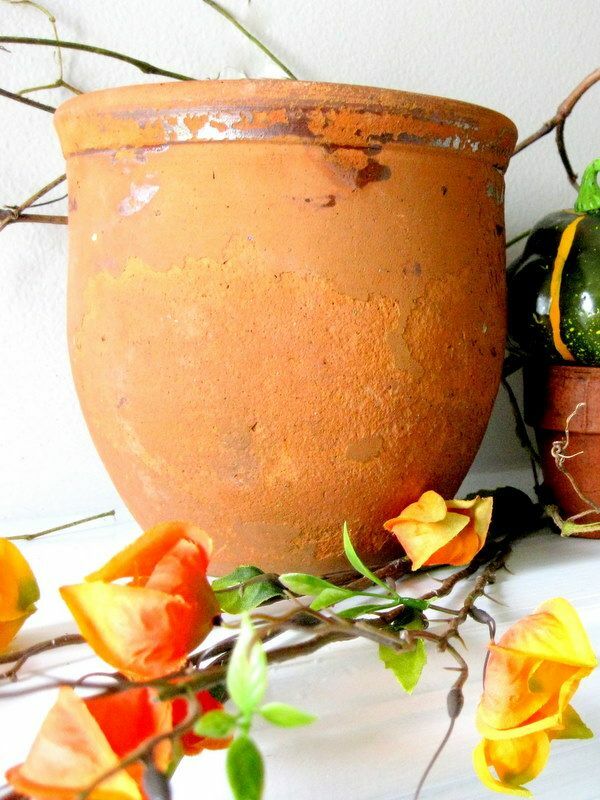 My favorite pot was once glazed inside and out. Even though some of the flowers are dollar store, fake orchids, I thought the color was perfect for the grouping. All the gourds are Styrofoam, because I can use them year after year. However, winter squashes, gourds, and pumpkins do paint up nicely. The other things I chose were the adorable, orange silk Chinese lantern flowers, the funky cluster of glass grapes, the little green and orange gourds, and, on the wreath, a cluster of silk grape leaves. I think the arrangement is festive without claiming too much attention in the room. It's perfect for a staged space -- simple and seasonal. 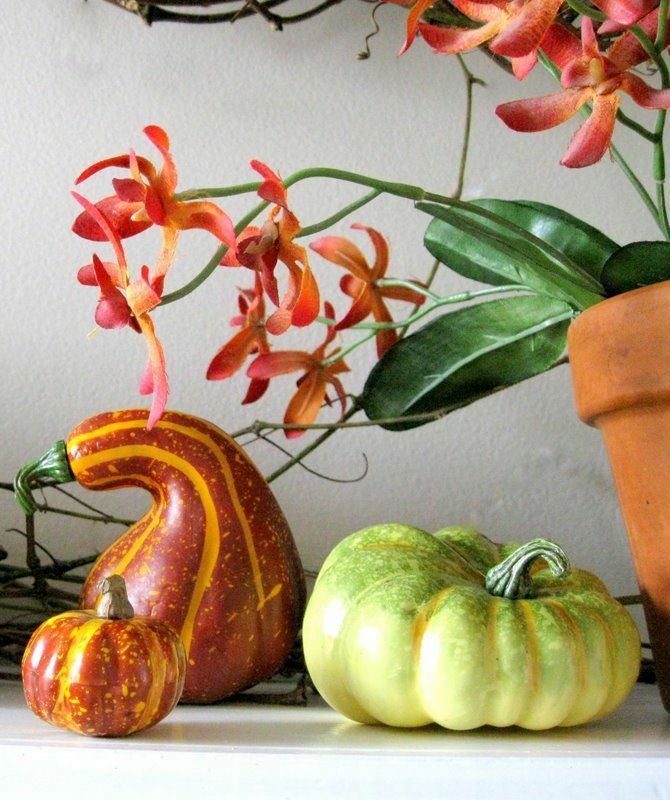 If you haven't added some autumnal flourishes to your home, now's the time. Timely decor gives the impression that your home is new on the market. And home buyers are sure to notice that your home gets loving and attention year 'round.